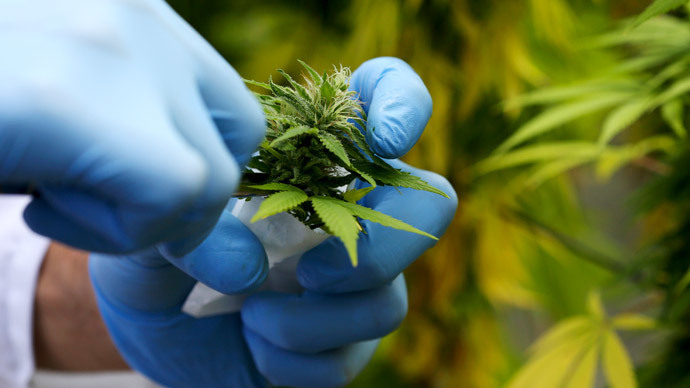 Kosher medical marijuana may soon be sold to Orthodox Jews in New York State, following the legalization of cannabis for medicinal purposes in half of US states over the past few years. Rabbi Moshe Elefant, COO of the Orthodox Union’s kosher certification agency, has held “preliminary discussions” with the agencies keen to get the kosher approval for the medical use of marijuana, the Jewish Daily Forward website reported. The Orthodox Union “would not have a problem certifying” medical marijuana, Rabbi Moshe Elefant said. A few weeks ago, his group was approached by a firm with several marijuana factories in Colorado, where both medical and recreational use are legal. Elefant wouldn’t precise the company’s name or say what kinds of food marijuana would be placed into, but he said that the firm’s representatives went to New York to discuss getting “kosher supervision,” the New York Post reported. While Orthodox Jews have come to terms with the use of cannabis for medical purposes, they still treat the recreational use much more cautiously. Cannabis has been shown to alleviate pain, anxiety, appetite loss and nausea in patients suffering from a range of diseases, including HIV/AIDS, cancer and multiple sclerosis. The progressive US Jewish population promotes the legalization of marijuana – for any type of use. Ean Seeb, one of the owners of the oldest marijuana dispensaries in Denver, Colorado, was at the forefront of the fight to legalize the marijuana – something that came to pass in 2012. “We have shown here in Colorado that you can effectuate social change without the world crashing down on you,” Seeb told the Jewish Daily Forward. Others see the main problem in the system that “isn’t working,” Claire Kaufmann, co-founder of a recently founded Jewish drug policy reform group, Le’Or, based in Oregon, said. “It isn’t protecting kids, it isn’t decreasing consumption levels and it’s perpetuating a black market which is dangerous and where the people running that market are incentivized to deal harder, more addictive drugs,” Kaufmann said. Marijuana is a plant, so kosher certification isn’t needed for cannabis, but in the New York State patients will not be permitted to smoke pot, so they would have to buy the substance in pills, food or drinks, which in turn require the kosher certification. Kosher medical marijuana is already certified in Israel, with 11,000 people legally receiving cannabis. The New York program of kosher medical marijuana is set to start next year, the New York Post reported.